We've been bustling around - getting ready to leave for a "car voyage". And I'm within hours of completing an interesting watercolor of a Maxinkuckee lake home. Kept putting off writing a blog - so I could share that painting with you. It is on my drawing board - with a written "to do" list of minor items to correct and/or complete. So I'll send that one for you to view shortly after we return from our exciting car trip. We are (I should say - Ward is) driving us west - close to Salt Lake City to visit his daughter, Michelle, and her family. The car is packed except for last minute items. Ward is snoozing now and I'll be cat napping within 15 minutes from the time we leave ye old homestead. 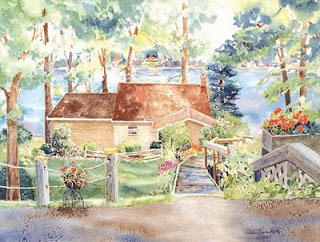 The painting above is a favorite of mine - this is Darlene and Bob's inviting home on Myers Lake - she asked for a view from the road, and after several futile efforts to take photos that would lure me to paint, I FINALLY took some pictures that got me rolling. With artistic license, I raised the lake above the roof line of their house, and slightly rearranged the trees to emphasize the patterns from this view. The finishing touch was the old fashioned planter in the left foreground. This was her mother's and very dear to her. She located photos for me to use for reference. By the way, I do have another 6" x 6" original partially done. It's another flag painting - and this time, it is OUR flag, taken from the side yard looking southerly. You'll see it here soon. Do I hear you thinking promises, promises, that's all I hear ? ? OK, I do promise. Time for me to hit the sack for the second time tonight. Darlene is watching over our gallery while we are away. She'll open up next Friday and Saturday, and will answer your phone calls while we are enjoying our time away. Her phone number is 574-936-4431. Her number is on both of our answering services. We thank her again and again for all of her assistance. Our web site is www.painterandpoet.com Until we return - have fun, stay well!